Little is known of Mintun’s youth other than he spent his childhood in Piatt County, Illinois before his family moved to Decatur in time for him to attend high school. 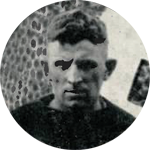 At age 18 he was the starting center on one of the town’s independent club football teams and is first mentioned as “Jack” in the local paper in November 1915 when he scored the lone touchdown for Decatur’s “Indians” club team thus defeating the Decatur “Athletics” for the city’s independent football title. Before World War I, Jack worked as a driver for the Decatur Model Laundry while playing baseball and football for several local club and industrial teams, as well as becoming one of the best bowlers in the city. On May 10, 1918, while on the Staley club baseball team with Charlie Dressen, Mintun was drafted into the U.S. Army. As they did with many local boys, the Decatur papers followed Jack’s infantry service from Jefferson Barracks in St. Louis to Camp Shelby in Mississippi to Camp MacArthur in Waco, Texas to France with the 34th Infantry in September. He was discharged on June 26, 1919 and two weeks later was back playing baseball with the Staley nine under player/ manager Joe McGinnity. Jack Mintun married Delsie Chandler in 1924. When she passed away he married Avis Dunham in 1970. He was a deacon at Decatur’s Central Christian Church and active in the American Legion and other veterans’ organizations. He is buried next to his first wife in Decatur’s Fairlawn Cemetery. Mintun was the only one of nearly 40 Decatur Staleys to spend his entire working life in Decatur.